Geek Lit Etc. : Why let a little something like death slow you down? Why let a little something like death slow you down? Gwen Dylan isn't your normal gal. She works as a grave-digger at an all-natural cemetery, for one, which automatically brands her as 'one of the guys.' She's recently cut ties with her past, so she only has a few people that she can truly call her friends. Oh, and she's a zombie. 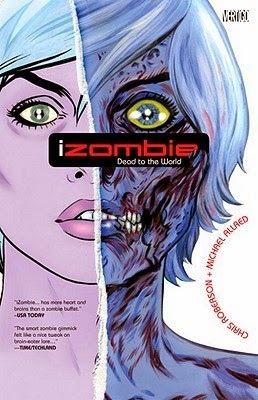 In iZombie Volume 1: Dead to the World, Gwen isn't exactly your standard shambling undead. As long as she maintains a steady diet of a brain a month, she keeps her focus and her memory. And so, being the moral sort, she's found herself employment that lets her be around plenty of brains that no one is using anymore. Honestly, her life is actually pretty normal for being a living dead girl. She lives in a crypt in the cemetery she works at, and has a slightly 'airheaded' ghost for a roommate. Her other friend, Scotty, is a 'thrope' of the terrier variety. But she still has a couple problems. When she eats a brain, which is by far the most disgusting thing she's ever had to choke down, she is flooded with the fragmented memories of that person's life. Sometimes it includes a bit of unfinished business that the decedent has left behind. Often it includes his final moments, and whether he died under...mysterious circumstances. It turns out, Gwen isn't the only undead in town either. A pack of vampires has taken up residence at a local paintball course, and while their leader is bright enough not to leave a trail of bodies behind, not all of them are. And there might be another, less ethical zombie in town as well. Chris Robertson does a good job setting up a world full of creatures of the night, while still giving us some rules to go by. The characters each have their own personality quirks already, with plenty of room to go. Gwen even has a love interest, of a sort. It's amazing how full a life a gal can have, even when she's dead. Highs: Gwen's friends are hilarious, and their antics are sometimes even more fun than the main story. Lows: The artwork isn't quite what I expect from a Vertigo title, and there's a lot of backstory still missing. Verdict: iZombie Volume 1: Dead to the World is a fun, quick read with lots of potential for future volumes.